Hi, I am interested in your 1985 GMC Suburban 2WD 2500 (stock #1023-NSH) listed on Autotrader for $15,995. I'd like to get more information about this vehicle and confirm its availability. 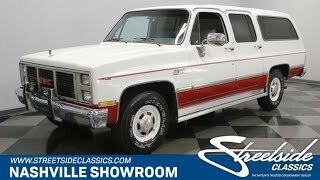 This 1985 GMC Suburban is that perfect affordable classic that has big V8 power so you never have to leave anyone or anything at home. And its well-preserved, right down to the paperwork. The factory-correct Frost White and Apple Red two-tone is a timeless color combo, so it looks quite distinct on this classic SUV. Plus, the red pinstriping that runs from the headlight and all the way around until it touches the other headlight is a great bold and premium touch. And speaking of premium, the full package is out to impress. Beautiful chrome bumpers, full length trim, and full-length running boards make this look far more substantial than its price tag would suggest. Best of all, this is the kind of classic that earns respect because so few have survived this nicely. Just one glance at the factory wheel covers will prove that this Suburban has had a nice life averaging only around 2,700 miles annually. Inside is where you can see even more care that has gone into keeping this Suburban looking its best. The factory gray bucket seats up front show very little wear, and the center console in between looks like no one has ever spent a road trip leaning on it. Carpets, door panels, and dash pad are all vintage 1985, and they are all in great condition. This is a high-end Suburban, and so came with a long list of options, including power locks, cruise control, tilt steering wheel, and the original AM/FM/cassette stereo in the dash. Even the factory air conditioning is still blowing nice and cold. Thats why this is the perfect machine to load up family and friends (you can even show them how a CB radio works!) In fact, this is a true road trip machine. It has the optional larger fuel tank and plenty of cargo room for secured storage. Plus, you might have noticed the Trail-o-Matic control under the dash. It combines with the HD trailering package, modern hitch, and full electric hookup to make this the ideal vehicle for everything from camping to towing the boat. With a Suburban that has been so well maintained so far, its no surprise to lift the hood and see the original V8 is such great condition. And yes, youre looking at a big block. The fuel-injected 7.4-liter V8 is exactly what you want for true truck/SUV duty. This rugged sophisticate is comfortable for the long trips, with power steering, power brakes (discs up front), and a strong TH400 three-speed automatic transmission. You can verify all these great features and much more, because the sale comes with the original windows sticker, owners manual, and dealer invoice. This Suburban is loaded, distinct, and has everything you want. So dont miss this deal, call today!